Includes Wind Sail engraved with up to 50 characters of your thoughts, feelings, names, and dates. Tuned to a pentatonic scale, features words of inspiration on the chime tubes. with Ash wood, 6 silver silk-screened tubes. This chime is tuned to a beautiful five-note scale found throughout the world, and features words of inspiration silk-screened on the tubes. Affirmations are used to support and encourage our highest ideals and hopes. When affirmations are repeated, they strengthen our resolve and empower us to turn our dreams into reality. Over time, they can significantly change the way we think, increase self-confidence and reinforce positive habits. May the music of your chime carry this inspirational message to you each time the wind blows, focusing your thoughts and serving as an affirmation of all that you strive for in life. 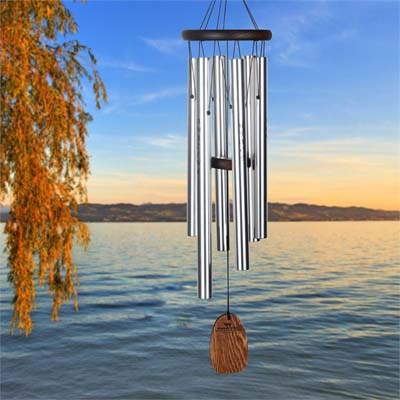 This chime was designed with a removable windcatcher for easy customization. Including a personal message such as a wedding date, note of sympathy or birthday greeting makes the gift that much more special. Woodstock Chimes does not offer engraving services, but the removable windcatcher can be taken to a personalization store, trophy shop, printer or jeweler to be engraved or silk-screened.